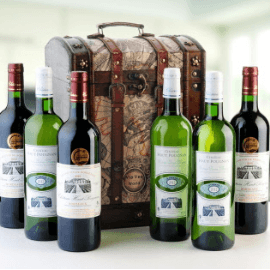 A beautiful Birthday gift, Six wine bottles in a Elegant keepsake chest gift box themed on the world map. Someone who appreciates fine wine. Wine gifts Bordeaux Six Chest set. 3 bottles of red wine Chateau Haut-Pougnan Bordeaux and 3 bottle of white wine of Chateau Haut-Pougnan Entre-Deux-Mers. A beautiful high quality wine gift. You can mix the wine either 3 red and 3 white or 6 white or 6 red. The slopes are home to East and South vineyards reds, the slopes West remain the domain of white wines. That is the nature of calcareous clay these soils resulting in very fine wines with subtle bouquet. The red wine, rich, fruity has a tanicity particularly well balanced, dressed in a beautiful dress, he continues to please with its elegance and balance in the mouth.